Sta nevicando in Silverton Mountain ?Grazie! 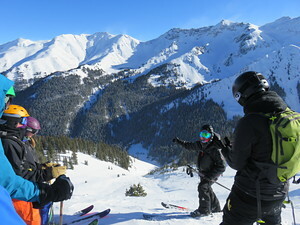 Silverton Mountain is an expert and advanced only ski/snowboard facility. One double chairlift will access the steepest, most powder-filled skiing this side of Valdez, Alaska. Silverton Mountain located in Silverton, Colorado, opened for business in January 2002. They are a guide-only operation with a maximum of 80 people a day and an average of over 400 inches of snow a year. The base lies at 10,400 feet with a chairlift rising to 12,300 feet. There is easy hiking to 13,300 feet. The mountain has been ranked best in steeps and powder snow in the USA and is known for incredible early and late season skiing. The mountain requires everyone to have an avalanche beacon, probe pole, and shovel (rentals are available). Open Thursday through Sunday, December through June. Silverton Mountain will have slope side huts in the future. Many hotels and cabins are available nearby. Silverton Mt. ski area isn't new anymore. It has good skiing but with limits. 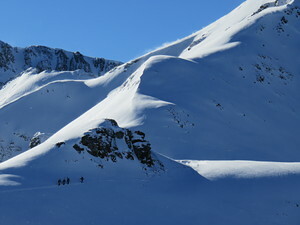 Most of the season you have to have a guide, and most guides they offer are not really that experienced, as most are from places with little or no real skiing. 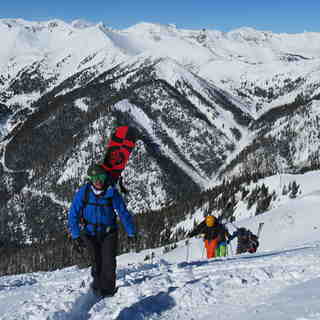 When you are guided you have to ski down then stop and wait for the rest of your group. If you go make sure your group is good. They also make you spoon your turns. I've been a number of times and the skiing was good but give me Highlands on a good day without the restrictions any time.